REVIEW: The BEST Things to do in Singapore with Kids | WITH PHOTOS! There are so many things to do in Singapore with kids you might be wondering exactly what to do in Singapore – especially if you are looking for ideas for kids’ activities! 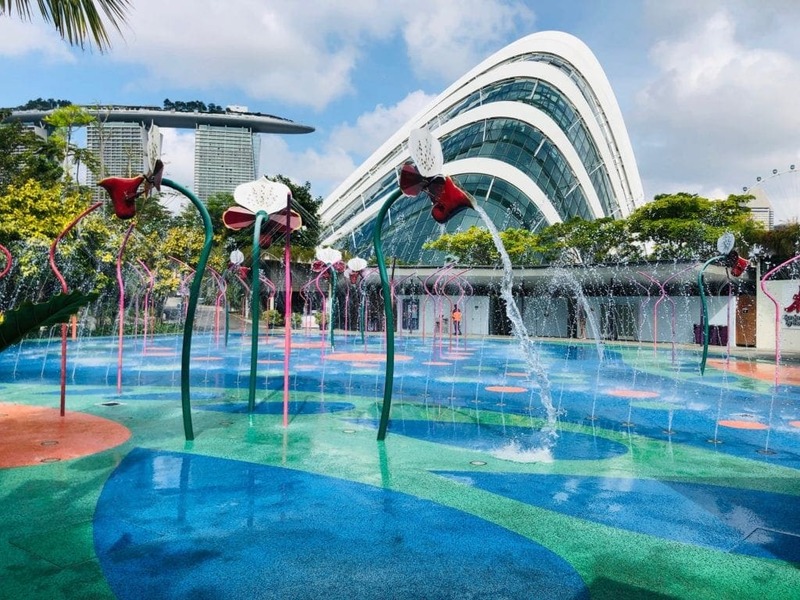 Once a ‘commuter hub,’ Singapore has now become a destination of choice and the opportunities for family friendly activities are wide and varied in this wonderful city! Singapore has an area of only 721.5 km² and a population of 5.6 million, so you will be spoiled for choice when looking for activities for kids in Singapore within a short commute. Our list is extensive and will give you all the hints and tips for ensuring you spend your time effectively and find the best places to visit in Singapore on your holiday. We’ve listed our favourite free things to do in Singapore with kids too… so you don’t have to break the bank to enjoy your family holiday. 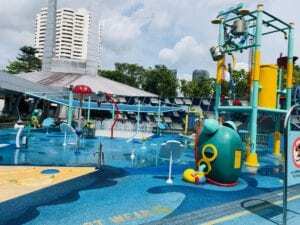 What’s on Sentosa Island for kids? The obvious first choice for any family visit to Singapore is the world class Singapore Zoo. However, there is not just one zoo, there are four zoos. They cover a total of 26 hectares. Here’s what you need to know. experience and be inspired by the wonders of nature. Animals at the zoos live in spacious and landscaped environments simulating that of their natural habitat. There is also a wonderful water park located within the zoo that is included in your entry price. My son loved it at 3 years old and love it again at 11 years old. It’s clearly a crowd pleaser for all ages! The Night Safari is the world’s first nocturnal zoo and is one of the most popular tourist attractions in Singapore. 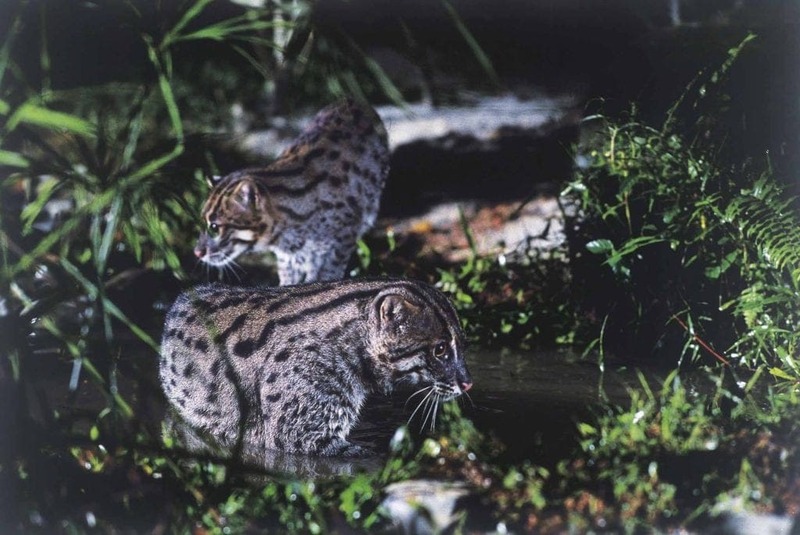 A visit to the Night Safari is a journey into the wilderness. 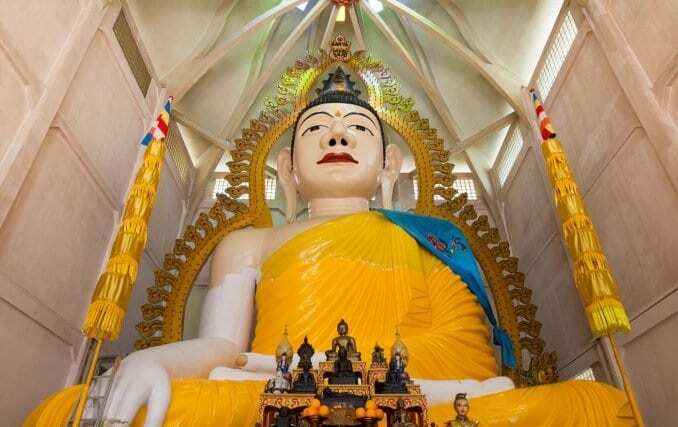 Designed to be explored on a 40-minute tram ride, visitors will be taken through six geographical regions, from the Himalayan foothills to the jungles of Southeast Asia. Through engaging and exciting live commentary, guests will get a deeper understanding of the habitats of nocturnal animals and hopefully, an appreciation for wildlife conservation. Zoos can seem much like one another. Even excellent zoos like San Diego or Singapore are conceptually the same despite how good they are compared to the others. However, the Singapore River Safari, next to Singapore Zoo, is built very differently. Instead of wandering around seeing whatever you want, the River Safari has a single path that takes you through the simulated environments of ten of the biggest rivers in the world including the Mekong, Mississippi, Yangze and Amazon rivers. With lots of touch tanks and tanks where it feels like you are really close to the animals, it’s really engaging for kids. The nice thing about the way the exhibits are set up are that it put all the animals and fish into some sort of context. It’s not just lions, tigers and leopards grouped together because they’re big cats – the river safari is set up so that if feels like you’re at the river. This a nice difference and makes it seem more of a journey rather than seeing a bunch of animals. At the end is a trip on an actual river. 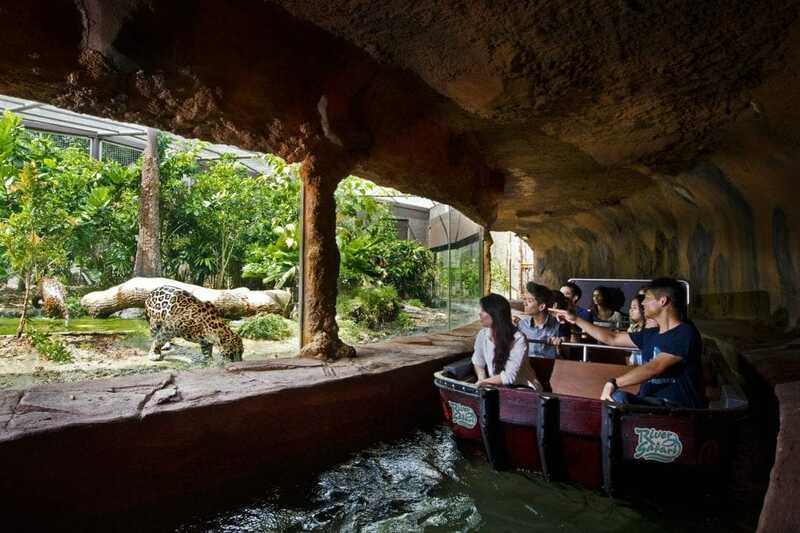 As part of the river safari, there’s a boat ride on part of the Singapore River where the zoos are located. There’s something about getting into a boat that made this my kids’ favourite bit of the journey. 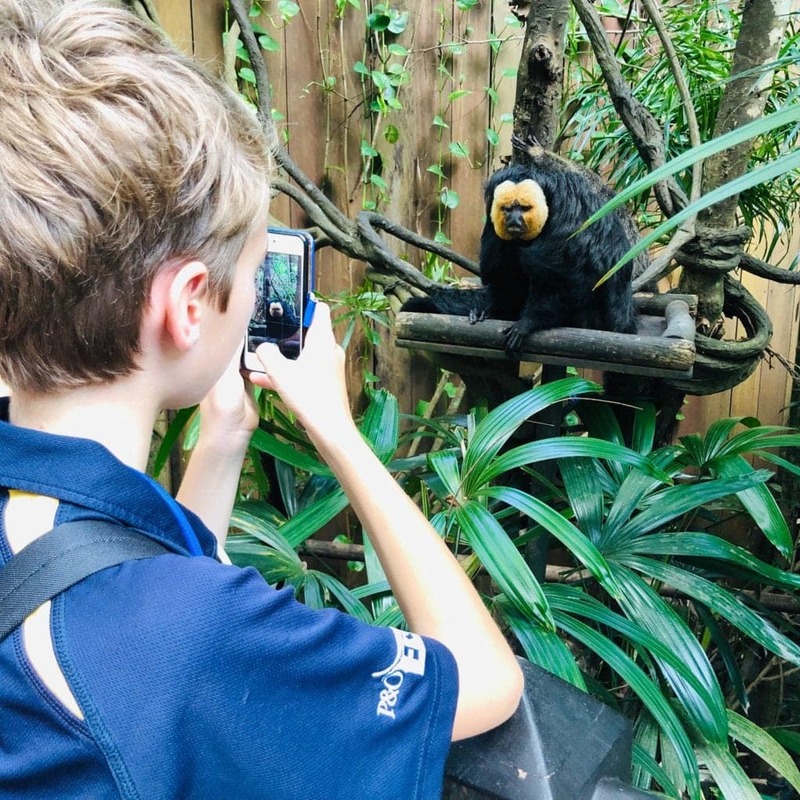 If you are in Singapore and thinking of going to the main zoo then consider the River Safari which is located right next door for a different and enjoyable take on what a zoo can be like. Tucked away from the hustle-bustle of the city, Singapore’s Jurong Bird Park is a must-visit tourist attraction with kids. It is a beautiful park with tons of colourful birds and species. From vibrant parrots to kingfishers and falcons to mighty eagles, you will find a great deal of birds to show your kids. The bird-themed water playground, feeding birds’ show and camping with penguins are some of the fun activities to entertain the whole family. Apart from these, there are a bunch of interactive family friendly activities to enjoy. Go for a Breeding and Research Centre tour where you can find wee-little feather friends which were newly hatched at incubation rooms and nurseries. Its best to grab a map and plan your day at the Jurong Park in advance. This is a huge park and there are plenty of exciting exhibits and attractions that you wouldn’t want to miss. Jurong Park has a number of aviaries including the world’s largest walk-in aviary with amazing waterfall and enclosures. We found the park quite peaceful with pleasant natural areas for the birds and when we were there it was not crowded. 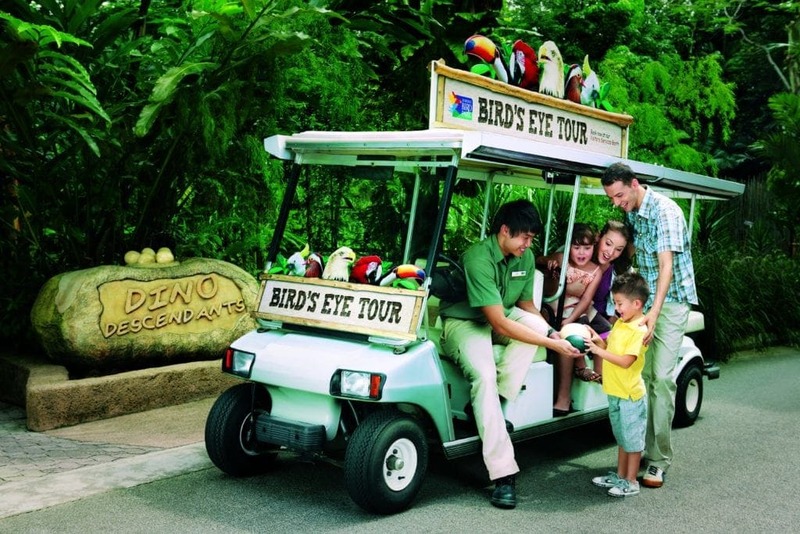 A trip to this bird sanctuary is sure to make the whole family happy and entertained. With thanks to Nitha from The Trailing Mum. Sentosa Island is a small man-made island resort which forms part of Singapore. 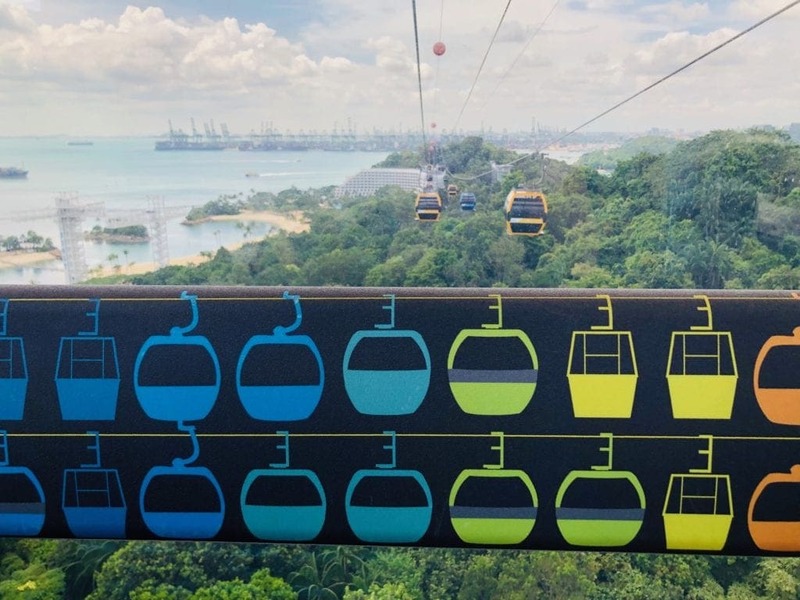 You can get to Sentosa Island by road, cable car, pedestrian boardwalk and monorail. It is a has been transformed into a theme park like resort for tourists and locals and below we will outline some of the family friendly activities you can do on Sentosa Island. 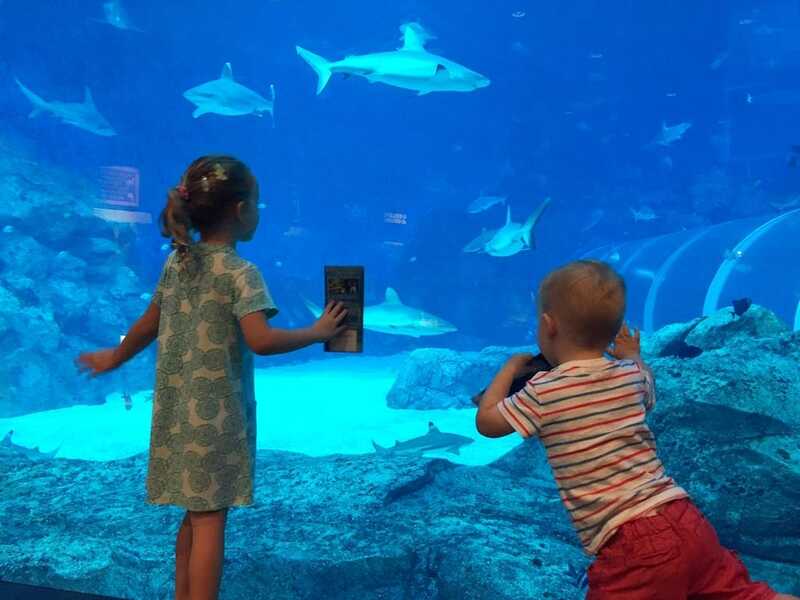 With over 100,000 marine creatures from over 1,000 species spanning 50 different habitats, it is hard not to be impressed by the SEA Aquarium. Located in the Resorts World Sentosa complex on Sentosa Island, this is a great rainy day activity or ideal to escape the heat and humidity of Singapore for a few hours. There is loads to see here, including a shipwreck to marvel at, tunnels to walk through and gaze at the sharks and touch pools for discovering knobbly sea stars. The grand finale is the very impressive Open Ocean – a huge panoramic marine vista complete with manta rays, sharks, and Goliath grouper. In addition to viewing the amazing sea creatures, there are plenty of learning opportunities along the way, with interactive stations helping to educate children on the importance of marine conservation and environmental awareness. VIP Tours and Shark Dives (ages 12 and up) can also be arranged and they even have occasional sleepovers in the Open Ocean Gallery! Here’s what you need to pack when travelling to Singapore. Enter the world of movie magic at Southeast Asia’s only Universal Studios theme park at Resorts World Sentosa. A must for mini movie lovers, Universal Studios Singapore features movie-themed rollercoasters, rides and attractions, in addition to giving you the chance to meet some of your favorite cartoon movie characters. 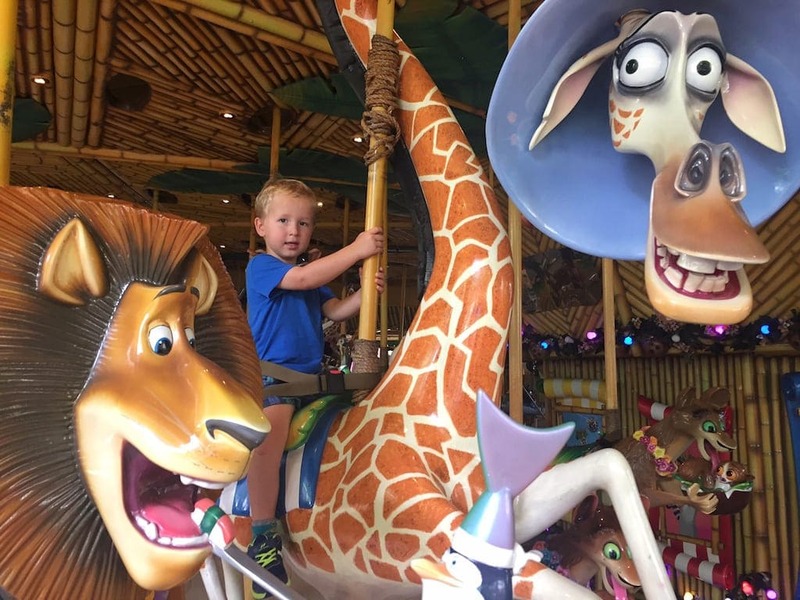 There’s something for kids of all ages here – even the really little ones will love Madagascar: a Crate Adventure River Ride, flying a Pterodactyl on the Dino-saurin’ Ride, and flying around with Donkey on the Shrek 4-D Adventure. At the other end of the scale, more adventurous thrill-seekers can get their kicks on board Transformers The Ride – a hyper-realistic 3D thrill ride; pitch black roller coaster Revenge of the Mummy; and Battlestar Galactica – the world’s tallest duelling roller coaster ride. As with other theme parks, Universal Studios can get busy and queues can get long. Buying an Express Pass is a great investment to save you standing around in the heat and humidity with the kids. Also remember to pick up a show times schedule at the gate so you don’t miss some of the fun performances such as Elmo’s TV Time and Lights, Camera, Action! Adventure Cove Waterpark is Southeast Asia’s only aquatic park integrated with marine life and centres a tale of ancient sea life civilisation, expressed in the waterpark’s architecture and design. The design revolves around three chapters of the Volcanic Archipelago, the Ancients, and the coming of the New Age. As you enter the park, you will be welcomed by the mystical winged-dolphins, Guardians of Legacy. Journey through the waterpark and look out for the intricate designs in the carvings, symbols and mystical creatures throughout the park, and spot the zodiac animals wall designs in the Grotto which connects you to the mysteries of the sea. 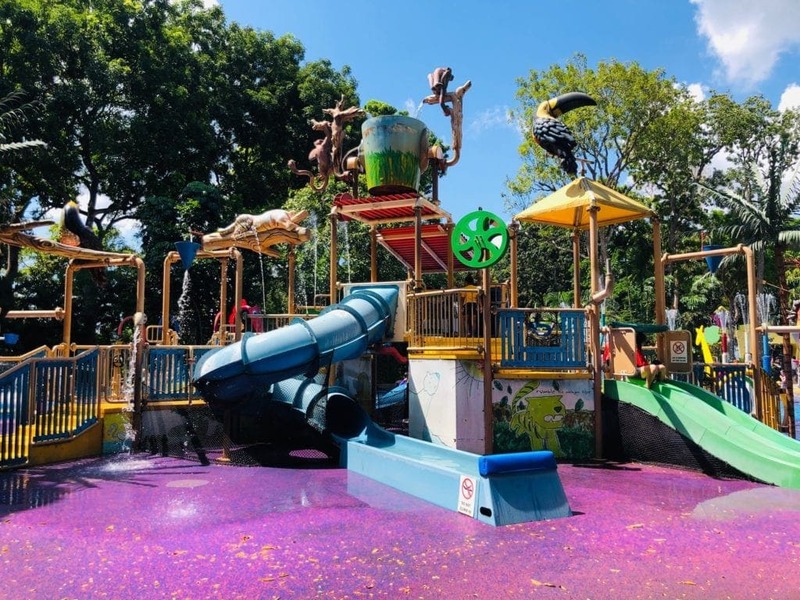 Offering a full day of splashing fun in the sun, Adventure Cove Waterpark is designed for thrill-seekers and families alike, promising an exhilarating day of enjoyment. Located within Resorts World Sentosa, the waterpark comprises of six waterslides and many other attractions, with a wide array of F&B offerings. It is a unique outdoor venue for fun and excitement, especially for those seeking respite from the tropical heat. 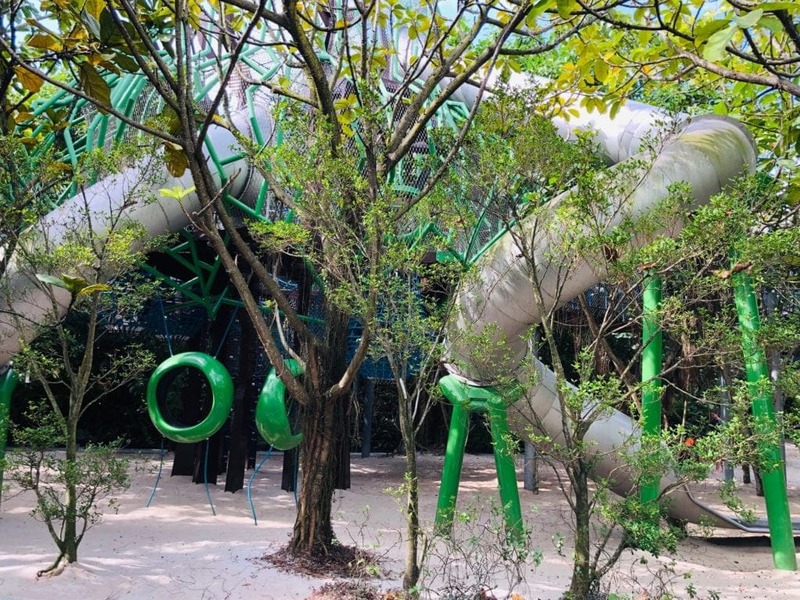 Guests to the park will feel the adrenaline rush as they zip down thrill-packed water slides such as Southeast Asia’s first hydro-magnetic coaster. 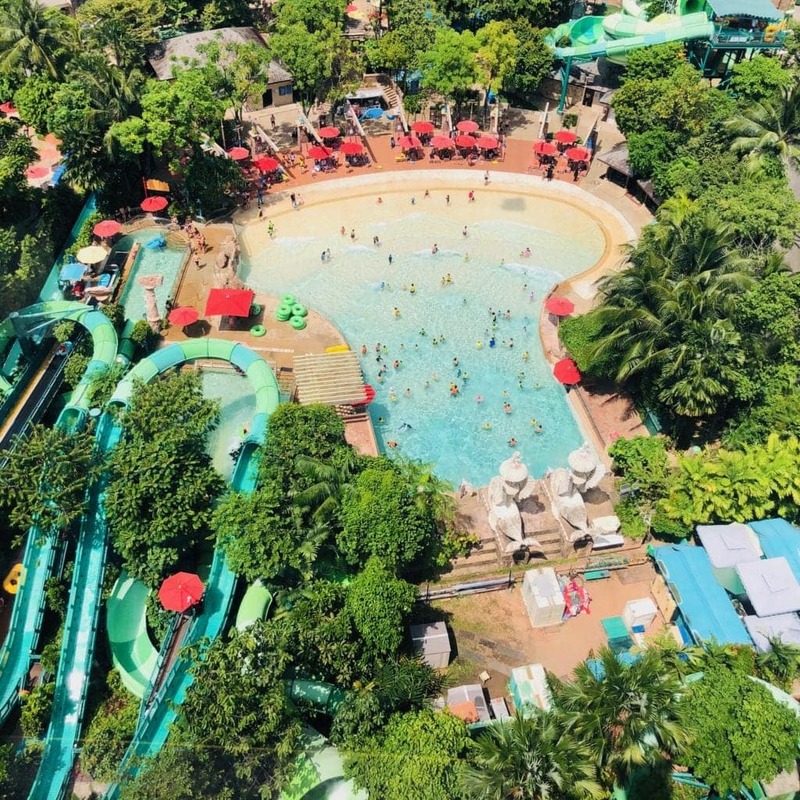 They can also chill out with friends and their loved ones at Bluwater Bay wave pool, or grab a tube and float down Adventure River, journeying through 14 stunning scenes including a tropical jungle garden and a grotto inhabited by mystical and fantasy-like never-before-seen marine creatures. We loved our journey on the cable cars – a definitely ‘must do’ when in Singapore. We did BOTH lines and got a great birds eye view of the whole area. Your kids love water theme park, and you’re on a budget? Then, you must visit Palawan Pirate Ship at Sentosa. While most attractions and activities in Sentosa cost you between $10 to $100, this water park is absolutely free. 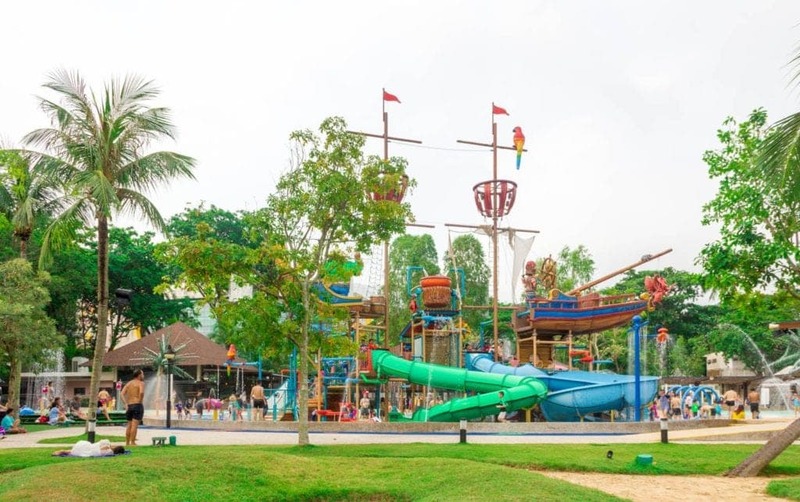 Located at Palawan Beach at Sentosa, the Palawan Pirate Ship is open from 10am to 6pm daily. 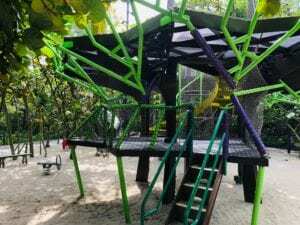 Palawan Pirate Ship is suitable for kids aged 3 to 10 years old. Swimwear is compulsory. Adults are allowed at common play area, but not the slides and ships. If your kids are night owls, this might be right up their alley. The premise is simple, the blue crane and the pink crane fall for each other – but there is still something magical about this performance, which happens daily from 20:00. Flashes of light and dramatic music accompany the performance as the large steel structures move gracefully through the night sky; and their chests are emblazoned with large screens that add an extra dimension to the story, which ends with the cranes flying away into the night. 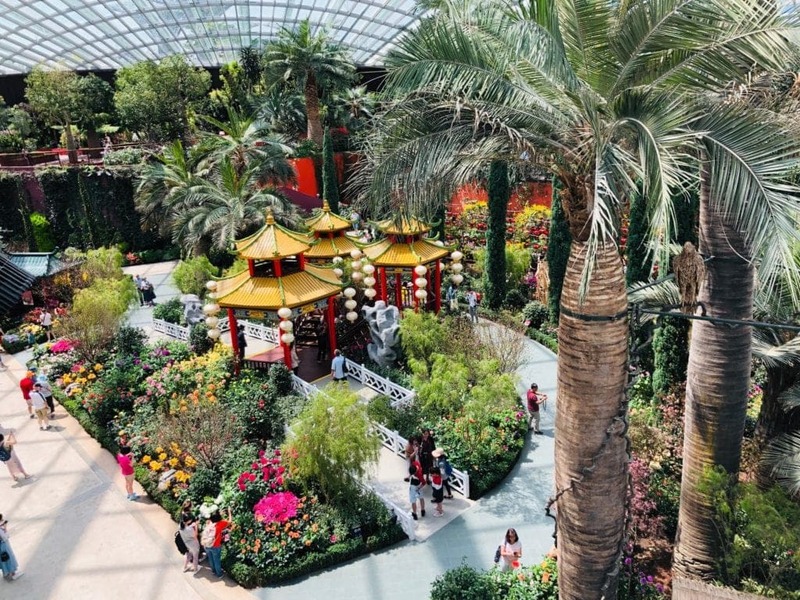 The magical Gardens by the Bay is another ‘must do’ activity when in Singapore. 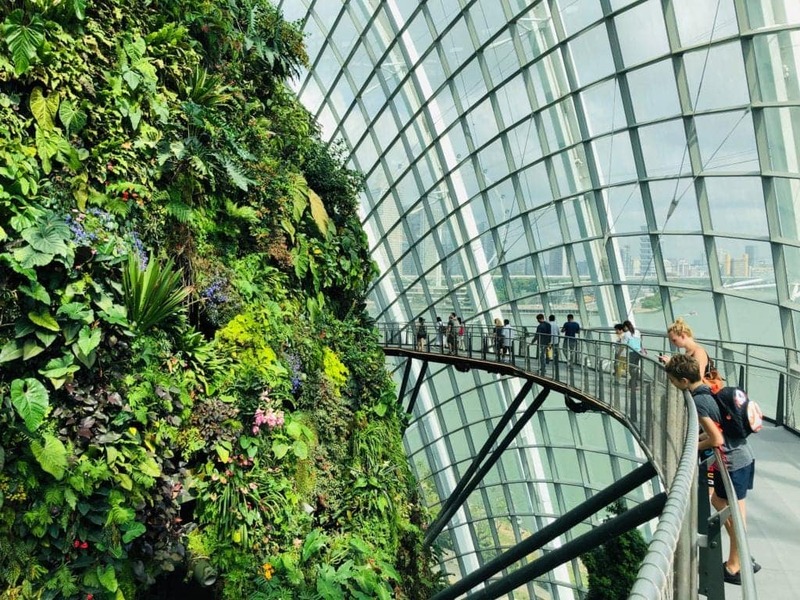 The area incorporates 2 huge domes; Cloud Forest and Flower Dome, as well as the Children’s Garden and Waterpark & of course the Supertrees & OCBC Skyway. We loved them ALL! The Cloud Forest is incredibly difficult to describe. I have never been in anything like it and it is a true experience. It is cooled to a lower temperature (a blessing in Singapore heat) and is a mysterious world veiled in mist. You are greeted by a waterfall upon entry and throughout your visit you can take in breath-taking mountain views surrounded by diverse vegetation and hidden floral gems. It is also a place to learn about rare plants and their fast-disappearing environment…. I urge you to add this wonder to your travel bucket list! Guided tours are free, but admission charge to Cloud Forest applies. The tours last approximately 15 minutes and are available on a first-come-first-served basis. Tours will begin when a group of 5 or more visitors are assembled. To participate, gather at the “ASK Me!” poster at Meeting Point A (The Falls) or Meeting Point B (Tree Top Walk) inside Cloud Forest. Enter a world of perpetual spring! Replicating the cool and dry Mediterranean climate, Flower Dome showcases exotic plants from five continents which are displayed in nine different Gardens. Wander amongst thousand-year-old olive trees and unusual Baobabs as you take in sights of the Flower Field Display. It simply is an amazingly beautiful and calming place to visit and I suggest you take your camera. When visiting the above attractions, remember to pack the kids swim suits so they can cool down in the Children’s Garden and Waterpark. With play equipment, such as a sway bridge and stepping springs, and the Fish Fountain with an interactive landscape of water tunnels and fish sculptures, it’s perfect for toddlers to clamber and play around. The waterplay area centre piece will delight younger and older children who love splashing about in water. The programmable water play is linked to sensors which detect the movement of children to create a corresponding sequence of water effects. *Closed every Monday. ^Closed on Tuesday if the preceding Monday is a public holiday. 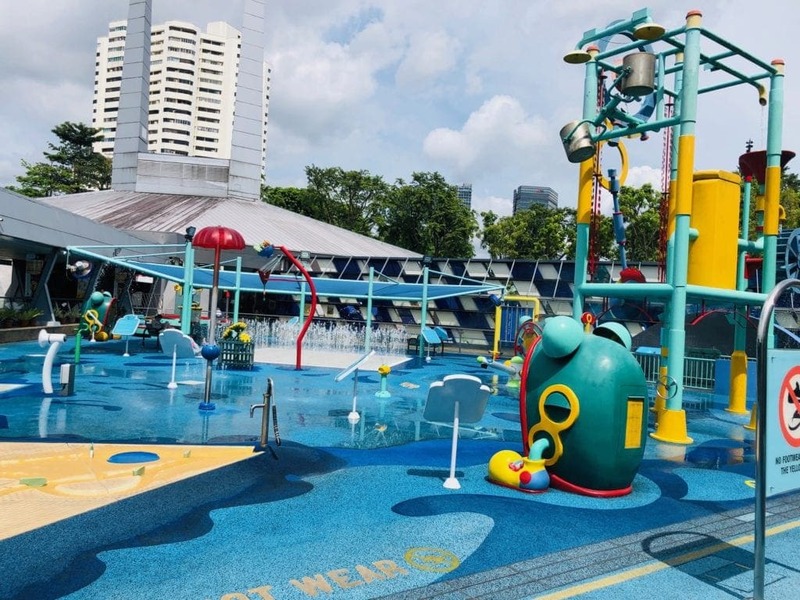 Please note that Waterplay and Fish Fountain areas are closed at 6.30pm on weekdays & 8.30pm on weekends/public holidays. Measuring between 25 and 50 metres tall, Gardens by the Bay’s Supertrees are designed with large canopies that provide shade in the day and come alive with an exhilarating display of lights and sounds at night. 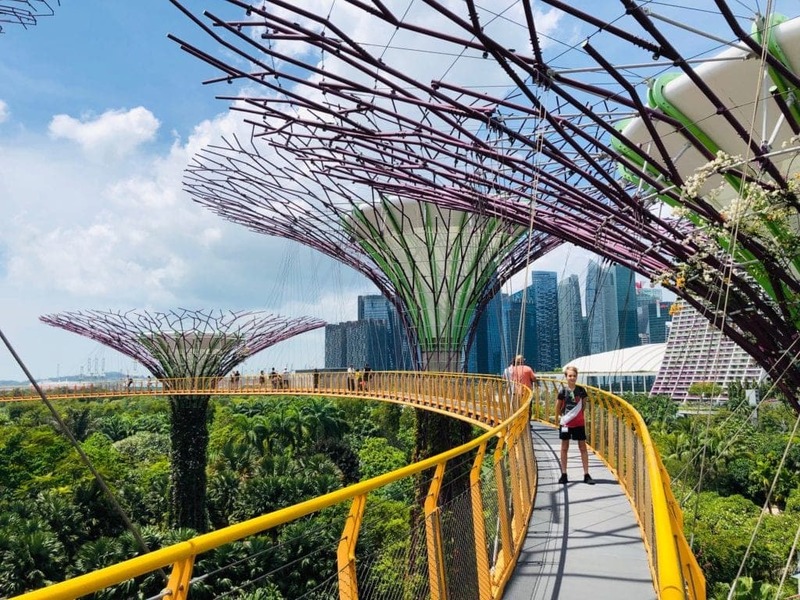 Stand in awe amidst these iconic giants or stroll along the 22-metre-high OCBC Skyway and enjoy panoramic vistas of the Gardens and the Marina Bay skyline. Located in the iconic, lotus shaped building by the waterfront at Marina Bay Sands ArtScience Museum is a museum with the motto “where art meets science”. This is indeed what you will find inside! Future World, the permanent exhibition features innovative digital installations, a bit like a digital playground. 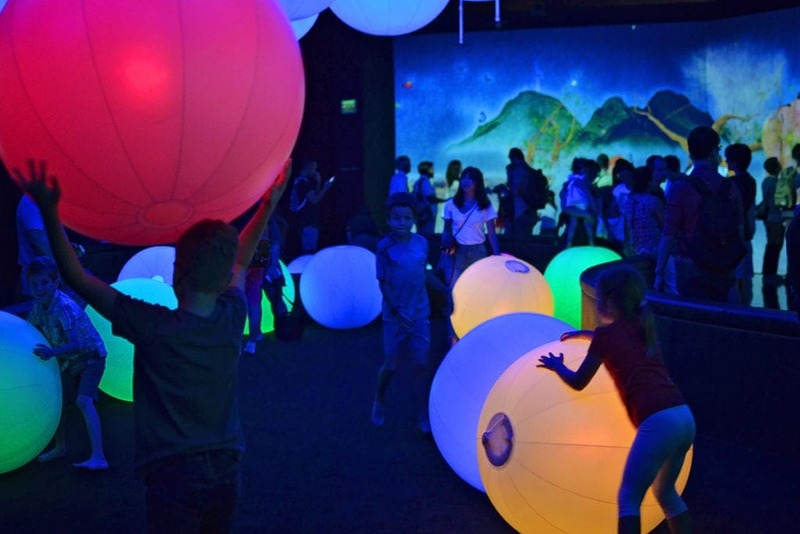 There are also loads of exhibitions dedicated to kids, like glowing balls and tiles, digital hopscotch and even a slide. They can colour in sea creatures or space rockets, scan them and watch them appear on the floors and walls. This area of the museum is very suitable for toddlers, but even primary school aged kids will have a blast. 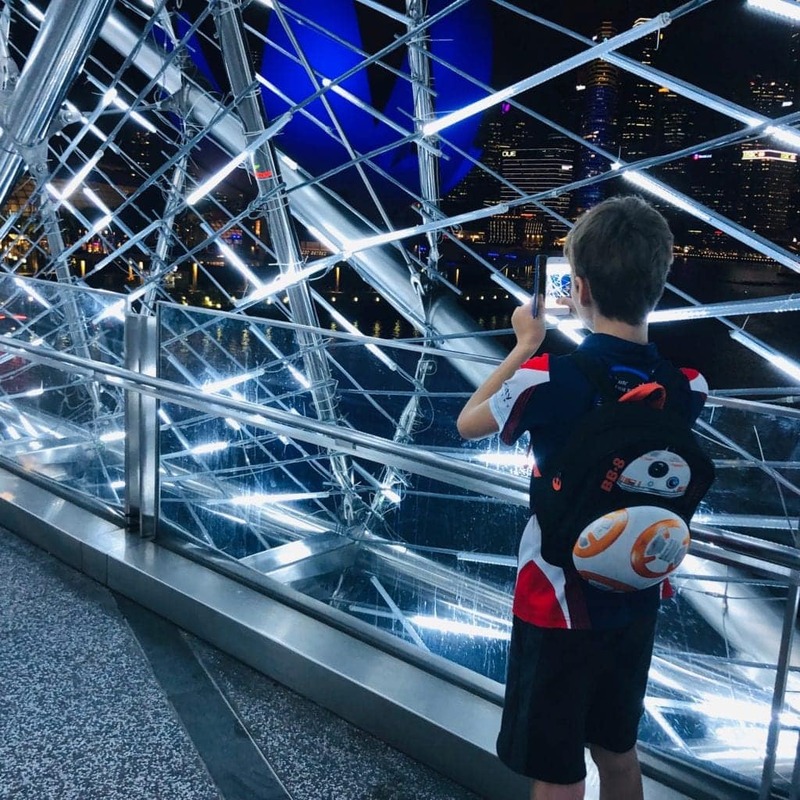 Kids and adults alike will appreciate a sparkly installation called Crystal Universe, that will make you feel like you are walking through a sky full of bright stars. Just outside the ticket counters you can try out the free rain forest themed augmented reality experience, Into the Wild. This collaboration with WWF turns the hallways into a jungle full of animals and tells a compelling story of human activity destroying it. You can book a viewing device online before your visit. The changing exhibitions are usually word-class, too. The museum gets busy on weekends and public holidays, so book your tickets online and go early! Hours: 10:00am – 7:00pm daily including public holidays. Last admission at 6:00pm. The Helix Bridge is a pedestrian bridge in the form of a curve that allows you to cross from the part of the Marina Bay closest to the Singapore Flyer to the area of the Marina Bay Sands Hotel. The bridge gets its name from the double helix represented by the two steel and aluminum spirals of very futuristic shapes that recall the structure of DNA. Along the bridge, there are several observation platforms with excellent views of Marina Bay on both sides like the ArtScience Museum and the Singapore skyline’s skyscrapers. 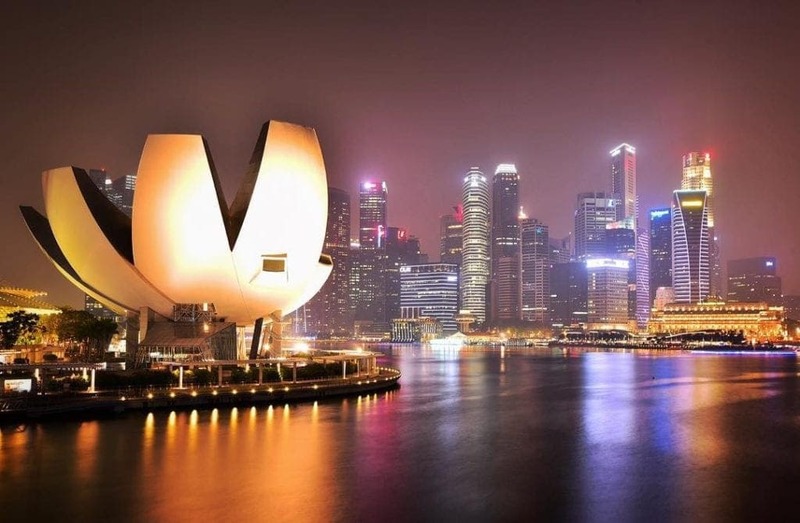 It is highly recommended to walk it at sunset or early night, when the structure is spectacularly lit, and also allows you to contemplate the beautiful spectacle of Marina Bay at dusk. As a curiosity, at night you will find on the bridge the pair of letters c and g and the pair a and t lighten up in red. They are said to represent the initials of the four DNA bases: cytosine, guanine, adenine, and thymine. Getting there: Alight at Bayfront MRT Station (CE1/DT16) Take Exit B and follow the underground linkway. Exit and cross the Dragonfly Bridge or Meadow Bridge into Gardens by the Bay. One of Singapore Harbor’s newer additions is the Singapore Flyer. 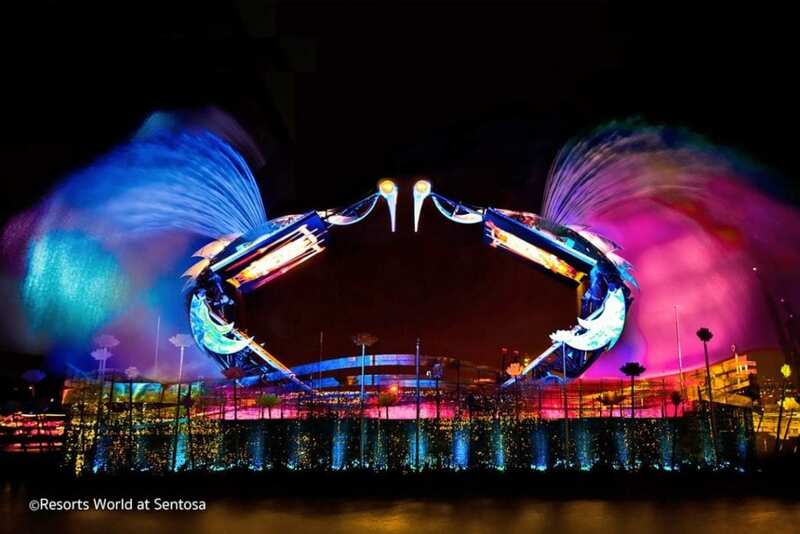 After its grand opening in 2008, it quickly became one of Singapore’s top attractions. The Singapore Flyer is a giant Ferris wheel located across from the famous Marina Bay Sands Hotel. It’s currently the world’s second largest Ferris wheel – only the High Roller in Las Vegas is bigger. You won’t miss it. The wheel stands in sharp contrast to the buildings around it! 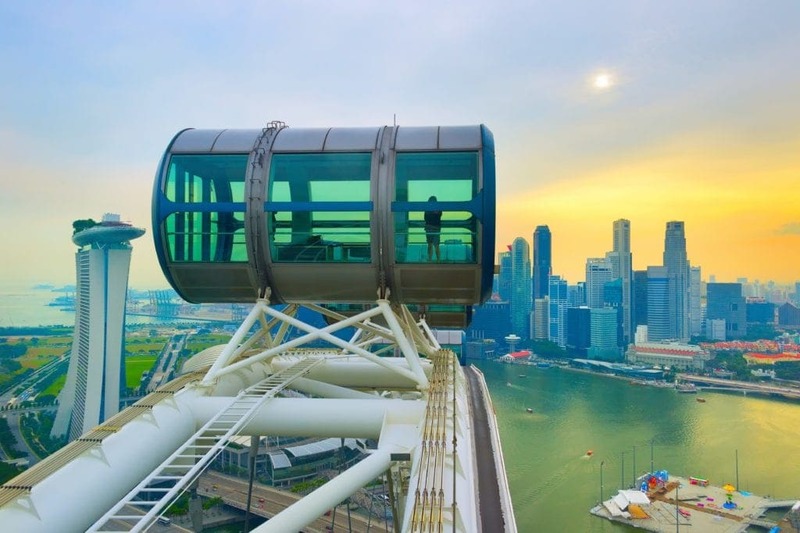 Parents and children will be treated to spectacular views when they hop into one of the 28 capsules and look out over Singapore’s skyline. After purchasing your tickets, either right there or online, make your way to the third floor to board the Flyer. Although the Singapore Flyer is a very popular ride, the boarding process is quick and efficient. It’s Singapore after all! The ride takes about 30 minutes, giving your family plenty time to appreciate the view. The Singapore Flyer is perfect if you have kids. Children under 3 ride for free, and there is a discount for children younger than 12. Heading to Singapore for the first time? Learn a bit about Singaporean traditions and customs before you visit. 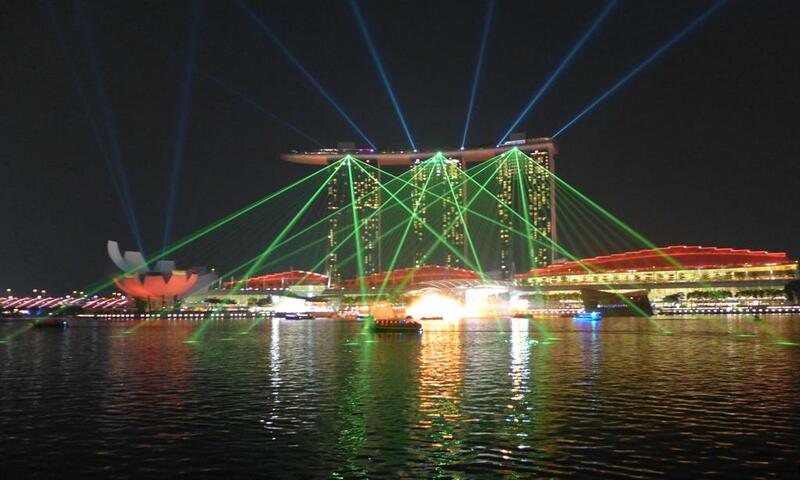 The great thing about the light and sound show at Marina Bay is that it is visible from both sides of the water. If you are standing in front of the hotel looking towards the city you can hear the music and see the projected images on the water fountains. From the city side looking towards the hotel you see not only the water fountains but also a series of lasers which light up Marina Bay Sands and the ArtScience Museum. This is one of the most technologically advanced light and sound shows in Asia. The music is highly emotive, inspired by live orchestral compositions. It’s perfect for children and adults too! 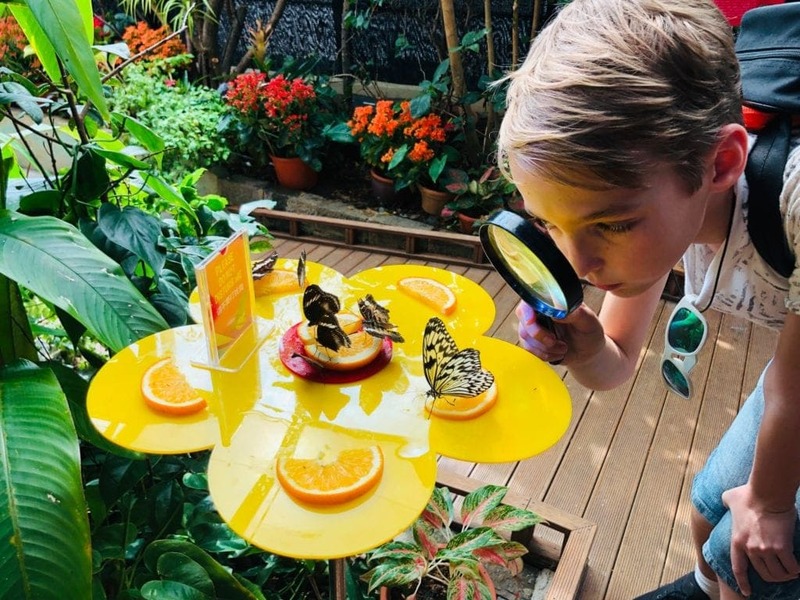 Whilst the bulk of the activities for kids in Singapore lie on Sentosa Island and in and around Gardens by the Bay, don’t forget these indoor and outdoor activities for kids in Singapore too! Some of these things to do with kids might be a little further (but still only a train ride) afield. 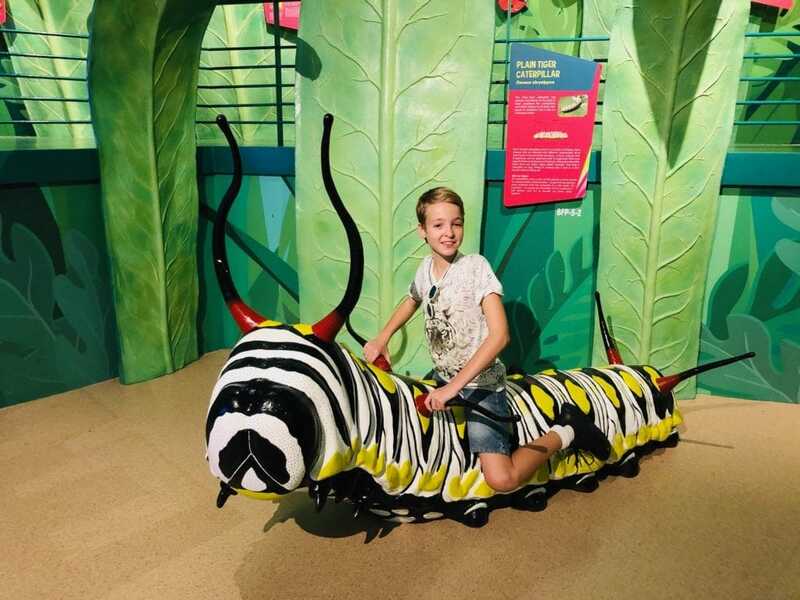 If you are looking for kid friendly places in Singapore, then we highly recommend the Science Centre, butterfly garden and omni-theatre. Situated in Jurong East, Science Centre Singapore is easily accessible by car, bus and the MRT. We spent a full day here from 10am and we still don’t think we saw and experienced everything that they were to see and do. From exhibits to shows to interactive science wizardry, Master 11 was fully enthralled for the whole day. We did all three attractions – the Science Centre, butterfly garden and omni-theatre – and only had time to look out the window at the water park! The fire tunnel was our favourite show but there is so much going opn here all day, your budding scientists wont be bored for even a second. 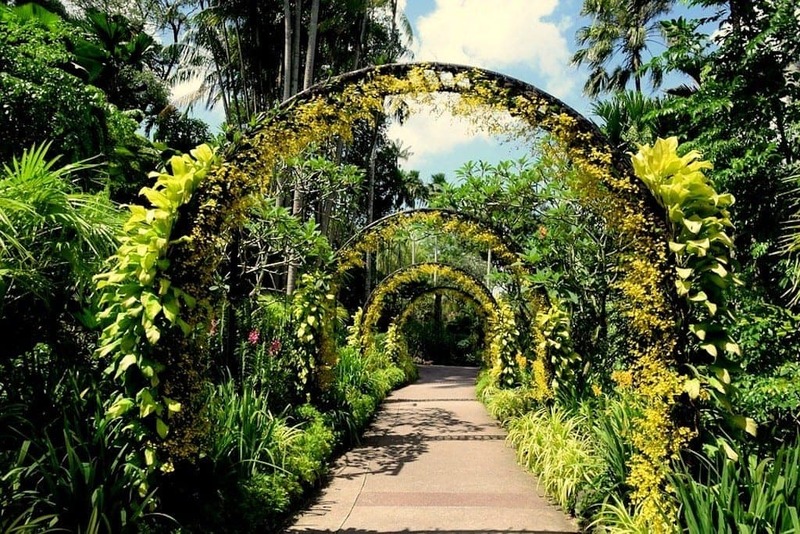 One of the interesting sights that one must visit with kids while in Singapore is the Botanic Gardens. The garden sprawls over a massive area of 82 acres and has a history of over 150 years behind it. Another feather in its cap is the fact that it is Singapore’s first UNESCO World Heritage Site. One of the attractions of the Botanic Gardens is the National Orchid Garden that houses a collection of about 1,200 species of Orchids and about 2,000 hybrids. The Botanic Garden is a living classroom which offers so much to discerning adults and kids alike. 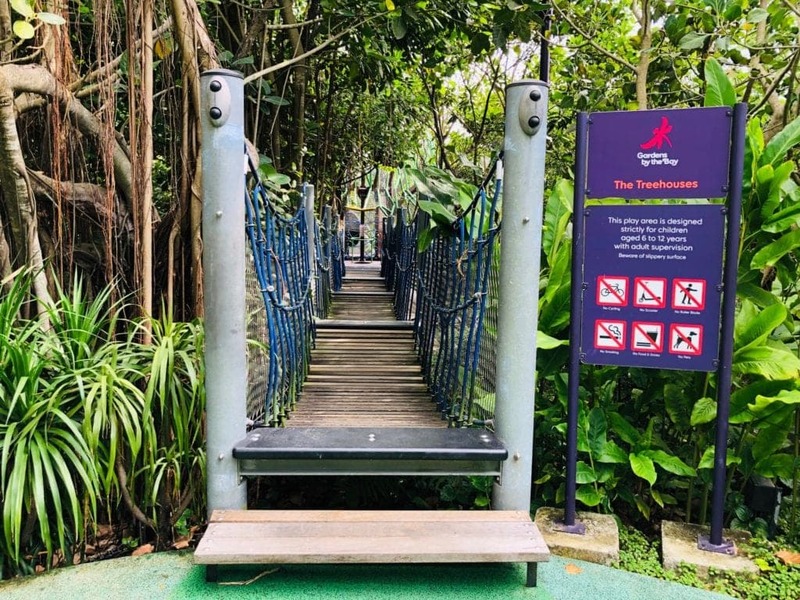 The Learning Forest within the Botanic Gardens is a series of walkways and boardwalks that enable visitors to experience different habitats including a lowland rainforest as well as a freshwater forest wetland. One can walk among some of the tallest trees in Southeast Asia here and learn about the different ecosystems. Guided educational tours for kids and adults are organized at the Botanic Gardens where they are shown examples of how plants adapt to their habitats, the different uses of plants as food, medicine, and much more. The tours help children to understand the importance of plants and their role in the ecosystem. Hours: Always open but visitors services staff are usually available from 8am – 5.30pm. The thing about strolling around China Town is, without a doubt, the ambiance! 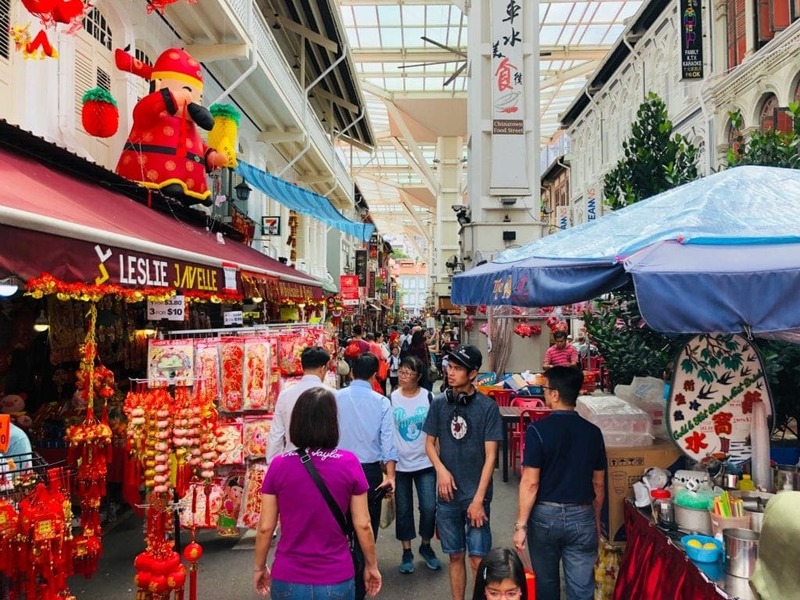 Even without much cash to splash, taking a walk about China Town in Singapore is must do activity for any visitor to the city. Kids will love the colour and the hive of activity while adults might like to sample the array of food on offer on just about every street. Chinatown’s maze of narrow roads includes Chinatown Food Street, with its restaurants serving traditional fare like Hainanese chicken rice, noodles and satay. Souvenir shops and indie boutiques dot the area, offering clothes, crafts and antiques, while Club Street is full of trendy wine bars. Cultural institutions here include the 1827 Sri Mariamman Temple and the ornate Buddha Tooth Relic Temple and Museum. Little India is known for its traditional Indian restaurants, especially along Serangoon Road and Race Course Road. The busy streets are filled with malls, jewellery stores and tailor shops. The landmark Sri Veeramakaliamman Temple is embellished with colourful statues of Hindu deities. Jalan Besar is a small hip area with quirky cafes serving specialty coffee and inventive modern cuisine. A visit is a delight to the senses and a cultural journey of sight and tastes! 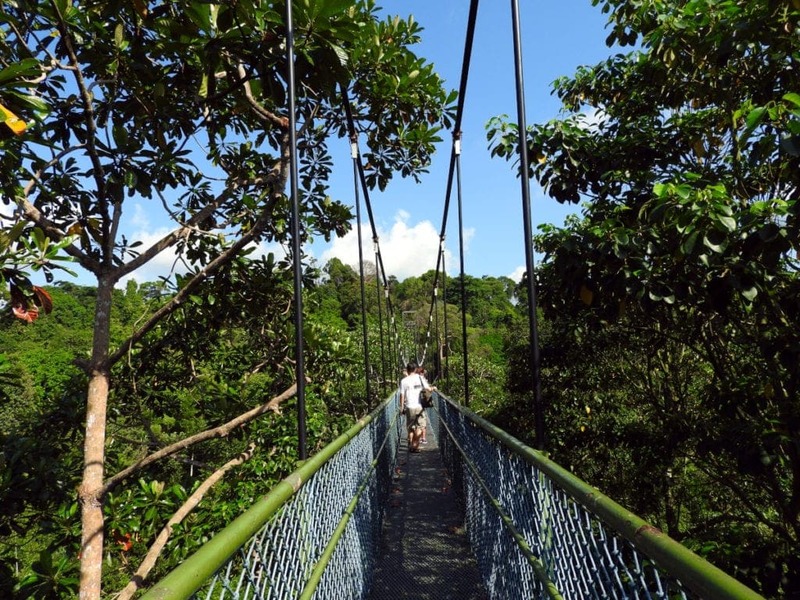 One of Singapore’s best activities for families is the MacRitchie Reservoir TreeTop Walk. Located inside the MacRitchie Reservoir, a large nature reserve just to the northwest of the city centre, this spectacular suspension bridge is 250 meters long and hangs 25 meters above the jungle below. From here, visitors have a birds-eye view of the reservoir’s unique flora and fauna, and a panoramic view of Singapore’s urban center. The MacRitchie Reservoir TreeTop Walk is ideal for families visiting Singapore. 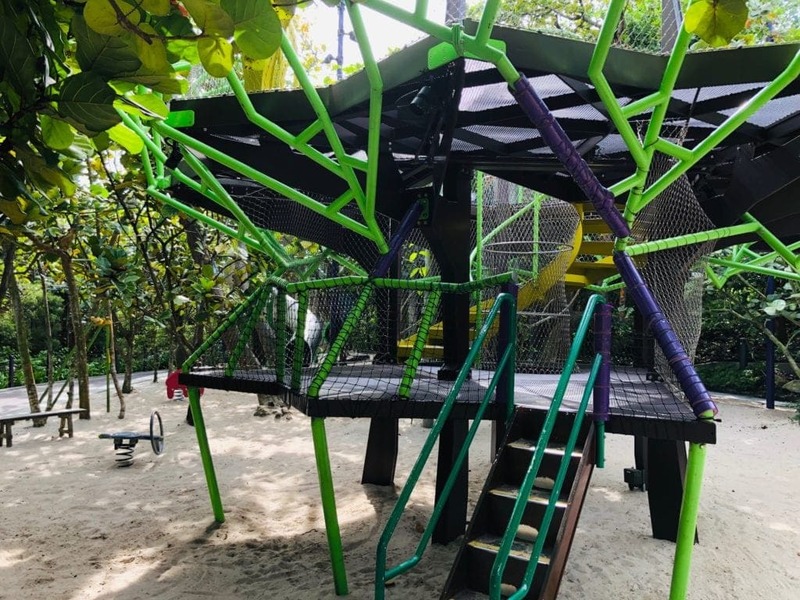 Children are delighted by the park’s many inquisitive monkeys, and there’s a good chance of seeing parrots, monitor lizards, snakes and other wildlife. Make sure that you review monkey safety guidelines with your children before entering the park, as the local macaques are not afraid of people (but they’re also not aggressive). As well, the route through the reservoir to the TreeTop Walk is a comfortable and easy walking route for even the youngest children. The entire circular trail is wide and well-marked, and most of the route is very flat. There are benches along the way, and a ranger station near the entrance to the suspension bridge is equipped with water fountains and clean toilets. Depending on the route that you choose and how often you stop, the whole walk will take about three or four hours. 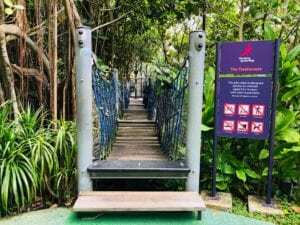 The Southern Ridges trail is perfect if you’re looking for an easy outdoor activity with some opportunities to learn about nature and wildlife in Singapore. While the entire trail is a comfortable half day stroll, there are multiple exits along the way with access to public transport which makes it easier for planning. There are no costs involved for walking on this trail. 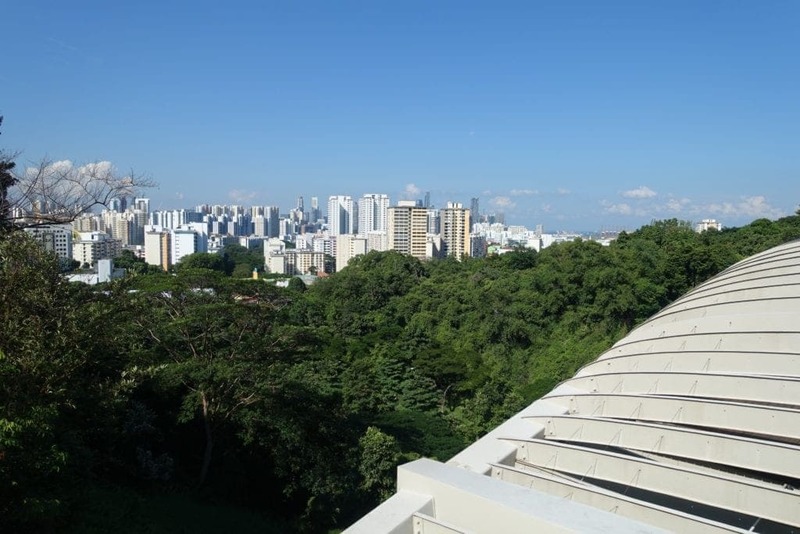 Starting at Mount Faber, you’ll get panoramic views of the city on one side, and views of the Southern Islands and the busy Singapore Strait on the other. The next highlight along the way is the Henderson Waves, a distinctive 274 metre long, 36 metre high wooden pedestrian bridge connecting what was once a continuous ridgeline. It’s a popular spot that can get crowded on weekends. Finally, enjoy an easy stroll on an elevated boardwalk through a secondary forest, great for getting up close to the foliage to learn about trees, and for spotting wildlife. Many other natural and historical points of interest can be found along the trail as well, so there’d be something fun to stop to every few minutes to learn something new. Best Travel Games for Kids | including Card Games for Kids! 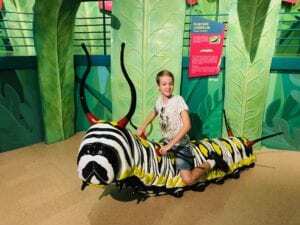 FREE & Cheap Australia Zoo Tickets | So pleased we found this!